Boston Handmade: Cambridge Arts Invites you to its Sixth Annual Cambridge Open Studios: this Weekend! Cambridge Arts Invites you to its Sixth Annual Cambridge Open Studios: this Weekend! For the first time since its inception, all of the Cambridge neighborhoods will be coming together for Cambridge Open Studios this weekend. On Saturday, April 26 and Sunday, April 27 artists across the city will be opening their homes and studios to the public. You will have the opportunity to sample the wonderful variety of art that Cambridge has to offer including paintings, ceramics, fiber arts, photography, and of course, jewelry. With Mother's Day just around the corner, this is the perfect opportunity to find a beautiful handcrafted present for that special mom in your life! I am excited to be exhibiting my jewelry for the second year in a row in my home studio (which is conveniently located just a short walk from the red line), where I will be selling my handcrafted modern chainmaille jewelry including bracelets, earrings and necklaces. 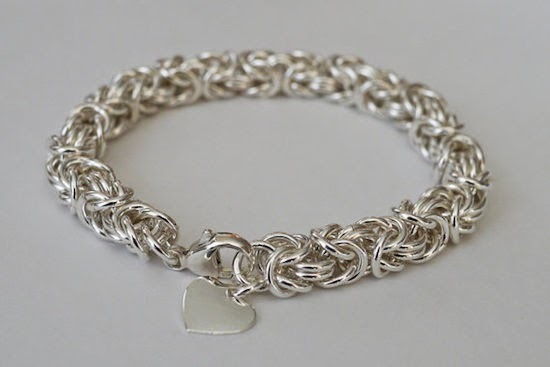 I will be offering a number of pieces at reduced prices, as well as some brand new pieces that are made primarily from recycled sterling silver. Open Studio hours are from 12:00noon to 6:00pm both days. Click here for a complete listing of artists participating, and download the smartphone app for information on the go!